In Britain, when you come staggering out of whichever pub or club you’ve been in, at the end of the night the tradition is to go for a kebab…well, if you can call it a kebab…if you can call it food! I think The Streets best described the British version of the Turkish döner kebab as ‘sh*t in a tray’ and, in our opinion, it must NOT…EVER be compared to a real Turkish döner kebab – which are of course lovely and wonderful and, most importantly, they contain real meat. They are real food. And so, when our friends come out to Fethiye on their holidays, we stumble out of Deep Blue Bar at some ridiculous early hour and someone pipes up with the inevitable bright idea, ‘Let’s go for a kebab.’ Well, they’re in Turkey after all. Don’t you eat döner kebabs in Turkey? But going for a kebab at the end of the night is not what people do in Fethiye. When you feel the need to eat food before that long, never-ending journey home, you go for soup (çorba). We used to think this was a bizarre idea – but having spent many an early hour in various 24 hour lokantas and soup kitchens around Fethiye, we’re true converts. Your soup is served with a big pile of fresh Turkish bread and usually a plate of salad (salad and soup – it’s a winner!) with a few whole, fresh, head-exploding chillies on top and some wedges of lemon. If you go to a decent place that takes pride in its soup serving, you’ll also get a bowl of mashed up garlic in vinegar. A couple of spoonfuls of this, a squirt of fresh lemon and a sprinkle of chilli flakes in your soup is just a dream! When it comes to soup flavours, there are the ones I can get with – and are probably familiar to you as well – and then there are the ones that – well, my nana and grandad would have liked them in their day but they’re not for me. 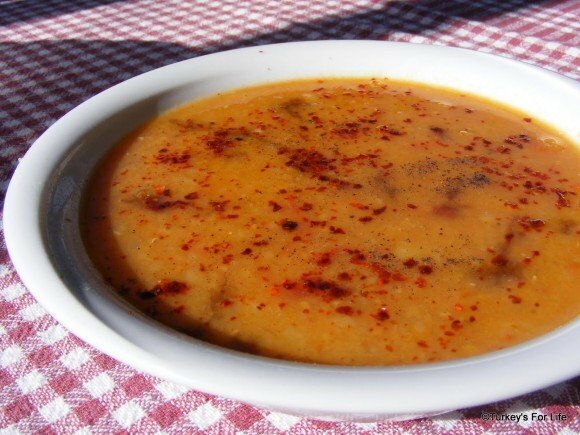 In at number 1 is most definitely Ezo Gelin Çorbası – spicy red lentil soup. Stick some extra chilli flakes on top of this and it’s the daddy of all the soups for me. White lentil soup. I opt for this one if there’s no Ezo Gelin available. Tomato soup. Sometimes served with some grated cheese sprinkled into it. White tops not recommended! Think melted stringy cheese dripping with bright red tomato soup and you get the picture. Click this link to follow our Turkish recipe for tomato soup. Okay, we’re getting to the golden age of when this sort of food was commonplace in Britain. It still is commonplace in Turkey and is quite rightly making a comeback in Britain too. It’s just that my tastebuds (and mind) don’t ‘do’ it. They’re in the chart because Barry and Turkish friends always order these. Hmm. Well, it can be either sheep’s shin soup or – as a friend matter of factly dropped in the conversation one night – sheep’s skull soup. This is Barry’s favourite and is basically the scrapings of meat from near the bone. (You see, that description just doesn’t do it for me even though the soup itself looks lovely). The one my nana and grandad would have wolfed down. Tripe soup! If that’s for you then good luck to you but you won’t be catching me with a bowl of stomach lining soup at 4 or 5 in the morning. Last and very definitely least for us…Brain Soup! No, no, no. When I’ve had a drink, I’ll try anything and we did have brain salad one night/morning. If you’ve never had brain, the texture is as you’d imagine (well, it was as I imagined anyway) but it was actually quite tasteless. We had to drown it in vinegar. Anyway, little floating morsels of brain in hot liquid don’t really make me think, ‘Beltin,’ so I leave that one alone. And there you have it. There are loads of other Turkish soups but these are your lokanta late night/early morning favourites. Obviously, soup is available all day in these places. It’s just that we end up there at ridiculous hours, but then so do loads of other people. And by that time, when you’ve had all sorts to drink and when you’re convinced food is the way forward as a magic hangover cure, whichever country you’re in, if you’re gonna be rough, you’re gonna be rough! Just enjoy the soup anyway. Today’s photo, by the way, is my Ezo Gelin Çorbası that gets us through many a winter. Great blog today,really interesting, and as usual,very funny. I agree, Turkish soup is the best. For us our late night venue of choice is Ali Baba’s, aka the soup kitchen in Kalkan. Open all day, every day and the chicken soup is “fan ‘bloody’ tastic”. Like you say, a big basket of fresh bread and a lovely salad with a really powerful onion just cut in quarters. Can’t beat it. Love the blog and look forward to reading all your escapades ! I hope you can find an internet connection too Jan or else we’ll be a reader down. He he. Or you could come to ours and do a guest post!! Christine, I didn’t mention chicken soup. Sorry. Mustn’t be big in Fethiye. You can’t beat the soup kitchen though can you? Thanks for reading our escapades. The soup sounds very nice to me. will try some next time over to Calis in July. All the (veggie) soups are lovely Maurice. Hope you enjoy them. You could even be brave and try the brain soup!